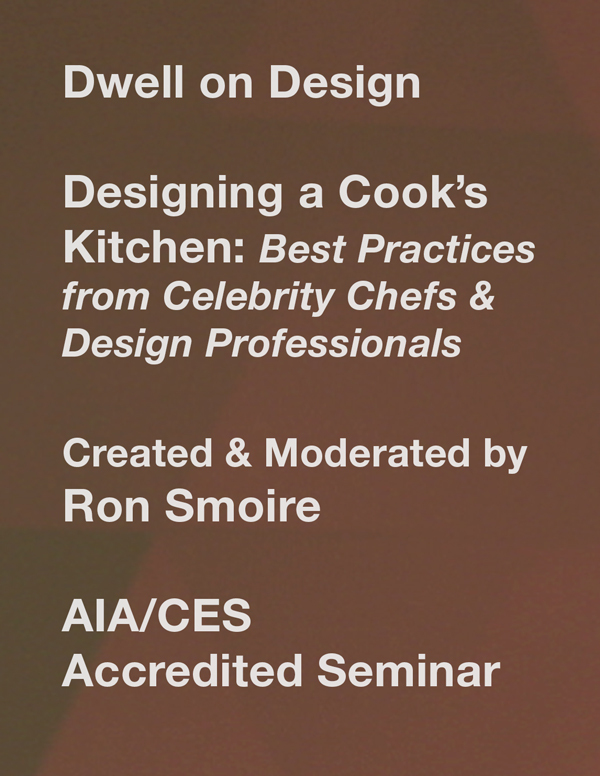 RON SMOIRE hosted a main stage panel at the 2017 Dwell on Design show where he brought together colleagues from both of his worlds – cooking and design. The panel, “Designing a Cook’s Kitchen – Best Practices from Celebrity Chefs and Design Professionals” focused on design and the designer/client relationship. Designing from a chef’s point of view - which prioritizes function over style - is a perspective that is not the normal programing method used by design professionals to design kitchens. The panel discussed the chef’s POV vs. the designer's POV. How do these needs differ or are they more similar than we think they would be? Panelists included two of L.A.’s most well-regarded chefs and two highly sought-after design professionals. Kitchens have evolved to communal gathering spaces that serve as the entertainment hub of the home. As a result, it is more important than ever that the kitchen is functional and that the materials and equipment used make sense for how the kitchen will be used. Commercial appliances or commercial looking kitchens have been a popular choice in residential designs for several years but they may be losing their luster. Having industrial looking equipment in the kitchen can make it more difficult to incorporate into the overall aesthetic of a home when there are open living spaces. Most residential homeowners don’t require commercial equipment and may not even understand the liabilities that are involved, from needing fire suppression systems to the dangers of no electronic pilot lights. Outdoor kitchens are becoming increasingly popular, particularly in places like southern California where they can be used throughout the year. These outdoor kitchens not only expand the cooking and entertaining space but also feature something that is very important to professional chefs – live wood fire cooking. As with indoor kitchens, it's important to design these outdoor spaces with function and knowledge of cooking needs to ensure they work and have the right equipment. Renovating a kitchen can be daunting with so many choices to make about cabinets, appliances and surface materials. All of these help to create the unique personal space that will be the client’s kitchen. Homeowners tend to overlook how they use their kitchen, and focus more on how it will look. The kitchen designer is the bridge to creating a more beautiful functional environment.